Support Plus Leg Wedge Pillows are designed at the perfect angle to help release tailbone tension and promote proper pelvic tilt. These pillows can help relieve leg discomfort, back pain, restless leg syndrome, varicose veins, and phlebitis. Feature a structural foam for maximum support along with a top layer of memory foam for superior comfort. Super-soft luxury quilted cover is zippered for easy removal and is machine washable. Measures 23 1/2" long x 7 1/2" high (at highest point) x 21" wide. THERAPEUTIC GRADE LEG REST PILLOW WITH 60-DAY GUARANTEE - Get superior relaxation and an array of therapeutic benefits by putting your legs and feet up on this wedge pillow. Perfect for use on your bed, the floor, or couch and ottoman. We're so confident you'll like it, we offer a 60-day, no-questions-asked guarantee. IMPROVE CIRCULATION - Laying in a raised-leg position helps blood flow from your feet, working to reduce painful foot and leg swelling from diabetes and edema, preventing blood stagnation and varicose veins, and relieving discomfort from deep vein thrombosis (DVT) and plantar fasciitis. Measures 23.5" long x 7.5" high x 21" wide. EXCELLENT FOR PREGNANCY AND POST SURGERY RECOVERY - Wide enough to allow both your legs to rest comfortably, use this pillow to elevate legs and create a "zero gravity" resting position that is so helpful during pregnancy and while recovering from surgery and injuries. Perfect for reducing pressure on lower back while sleeping. TWO-LAYER HYBRID MEMORY FOAM - For superior support and comfort, a soft memory-foam layer on the outside surrounds a firm base foam cushion on the inside. 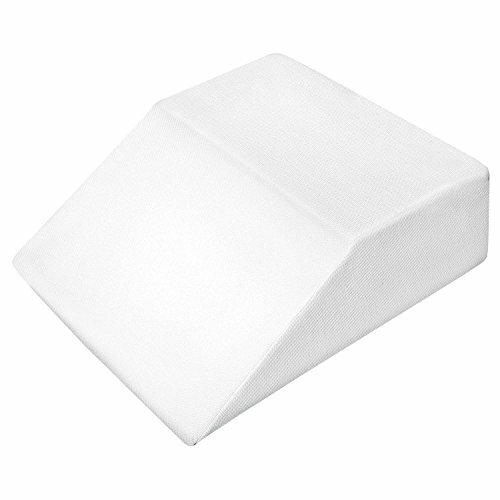 Pillow remains soft and keeps it shape after years of use. Be sure to use caution and do not use a sharp object when opening your package to avoid cutting or damaging the pillow. REMOVABLE ZIP-CLOSE COVER - Easy to keep clean, comes with soft, breathable, and machine-washable white cover that keeps the memory foam pristine and protected for years of use.